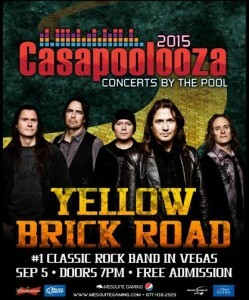 MESQUITE, Nev. – The CasaBlanca Resort and Casino, 950 W. Mesquite Blvd., in Mesquite, invites you to celebrate the unofficial end of summer as they present the season’s fifth and final Casapoolooza Concert by the Pool Saturday evening. Doors open at 7 p.m. Pacific Daylight Time on this free 21-and-over event held at the poolside oasis of the CasaBlanca. The five-concert series this summer has run the gamut of musical styles from the laid back, beachy tunes of Jimmy Buffet presented by the Stinson Brothers to the flashy musical stylings of Zowie Bowie, the nerdy Spazmatics and the power ballad tunes of Lights, a Journey tribute band. Saturday’s concert will highlight classic arena rock as the popular Las Vegas staple Yellow Brick Road graces the stage. Formed in 1997, according to their bio Web page, Yellow Brick Road got its original start as an Elton John tribute band but quickly found that it was their classic rock tunes that were getting the most attention. Today they play music from Kansas, Led Zeppelin, Pink Floyd and more as they do show after show for their large fan base. “They never disappoint as far as music and entertainment,” Adderson said. Saturday’s concert will kick off with doors opening to the pool area at 7 p.m. and DJ Jimmy Z will get the music flowing and crowd warmed up before Yellow Brick Road takes the stage at 8 p.m. This year’s season of concerts by the pool has brought in record crowds, Adderson said, as thousands of people have come to enjoy high-quality entertainment in an almost unbeatable venue. Overall, the season, which kicked off in May, was a success, Adderson said, and they hope to end it with one last hurrah Saturday. Although the Casapoolooza season is coming to a close, the CasaBlanca will continue to offer a wide variety of live entertainment throughout the fall in the showroom. You can look forward to some big Vegas headliners, the Southern Nevada Symphony Orchestra, more great selections of “In It’s Entirety” concert series, top tribute bands and great comedy. The final Casapoolooza concert falls during the Labor Day holiday weekend. With 500 rooms, world class golf, spa and dining amenities and a free concert, the CasaBlanca Resort and Casino is an ideal place to spend the end of summer. When: Sept. 5 | Doors open at 7 p.m.